Note: This is not your GrandPappy's webcam cache. It is an Adobe Flash powered streaming video webcam (the quality is amazing, I might add). It is not a simple "right click and save image" webcam. However, using modern technology available to Geocachers, you can easily capture an image with you in it. Feel free to practice at home before visiting the actual cache site. First, some history. Mr.Yuck failed to create any "alt site" caches when he was in Virginia Beach for four days in April, 2014, although he did create a virtual in Delaware on the way down, and one in SW Pa. on the way home. 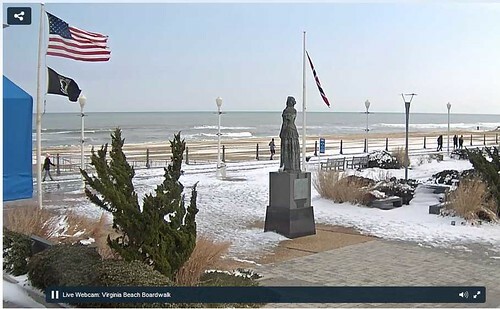 Over 10 months later, during the brutal winter of 2015, he said to himself "Self, I wonder if there are any webcams on the Virginia Beach boardwalk, so I can see if they got any snow down there". Not only is there a webcam, there are four! 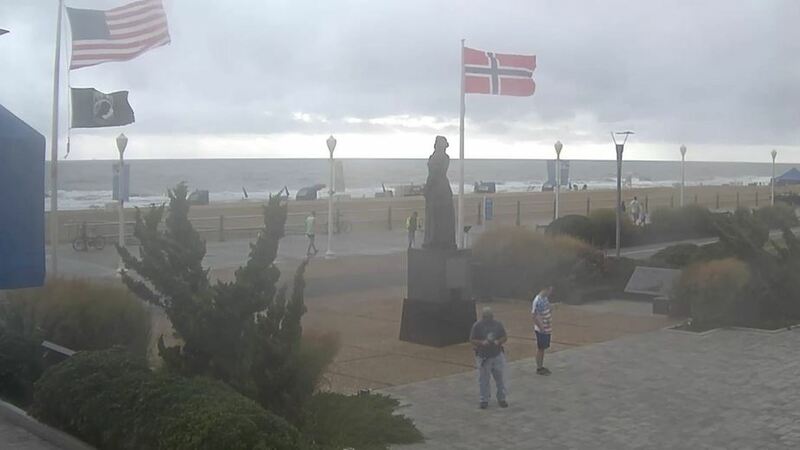 The Norwegian Lady Statue is a memorial to commemorate the lives lost in the March 27th, 1891 shipwreck of the Norwegian ship Dictator (based out of Moss, Norway) off the coast of Virginia Beach. Due to the valiant efforts of the citizens of Virginia Beach and The United States Lifesaving Service (predecessor of The United States Coast Guard), 10 of the 17 persons on board were rescued. When the ship's wooden female figurehead washed ashore, it was erected as a memorial to those who lost their lives. It stood on the boardwalk for over 60 years, before being severly damaged during Hurricane Barbara in 1953, and was moved to a City owned building for safekeeping. A couple years later, the City could not find the figurehead, speculating that it has been stolen, or lost by accident. With news of the missing memorial spreading throughout Virginia Beach and Moss, Norway, a fundraising effort was undertaken that turned out to be so successful, that it raised enough money to commision two nine foot bronze statue replicas of the figurehead for both Virginia Beach and Moss. The twin statues were unveiled on September 22nd, 1962. Both statues are virtual caches on Geocaching.com, incidently. So how are you going to log this webcam? First you'll need to go to it's webpage at http://www.courtyardvirginiabeach.com/webcam/ You'll see, being a live streaming webcam, you'll have to hit "play". As previously mentioned, whether you're on a desktop or laptop computer, or a smartphone web browser, the ol' "right click and save" deal won't work here. But don't worry, you can capture a webcam image with yourself in it no problem. I have used the Geocaching.com virtual cache coordinates for this cache. Obviously, the best place to stand is just behind the statue, with your back to it, and the boardwalk. Old fashioned computer method: Should you find yourself on the boardwalk alone, and in the need of the services of someone at a different location behind a desktop or laptop computer like it's 2004 or something, they merely need to do a classic screen shot to save you in the picture. On most computers using any version of Windows, they hold down the Ctrl key and press the PrtScn key. They can then "paste as new image" in their photo editing software of choice, such as Microsoft Photo Editor. Of course they'll get the entire web page; it is recommended that they crop out the webcam view portion of the web page, but not mandatory. The picture at the top of this cache page was captured using this method. Smartphone method: When you hit "play" on the webcam, you'll find the streaming video opens in your video player, and you're not even on the web page any longer! No worries, you can still do a screen capture. On most Android phones, for example, you can hit your power button and your volume down button at the same time for about 3 seconds until you hear the classic "camera clicking noise", and you will find the image under "screen shots" in your phone's gallery. You can see an example of this in the Pictures section below. Then upload your picture with your log, keeping in mind OCNA has a 500 kb limit on uploads. Enjoy your visit! Be sure to log the Geocaching.com virtual also. And don't forget to practice at home before you get there! Well, I don't know what happened, but I must have deleted the photos I took with my camera. So for now, it doesn't matter that the link is down. The link to the webcam no longer works. Can the CO determine whether there is a new one? I will be in that area for the next few days. I'll snap a photo just in case. First OCNA cache for me and first webcam cache ever for me. I am in the black jacket in the photo. Went to Hampton Roads to attend the GCHR Mega and made Sunday morning run down to VA Beach to grab some alt caches. 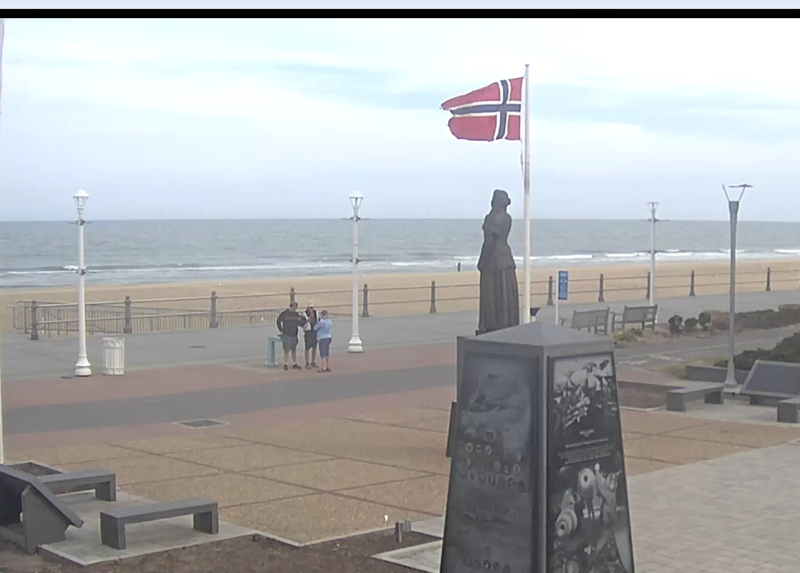 Very much liked this one as much for the Naval Aviation memorial adjacent to the lady, as for her and the webcam. You'll see me and my son, JuniorNimrod, in the picture.